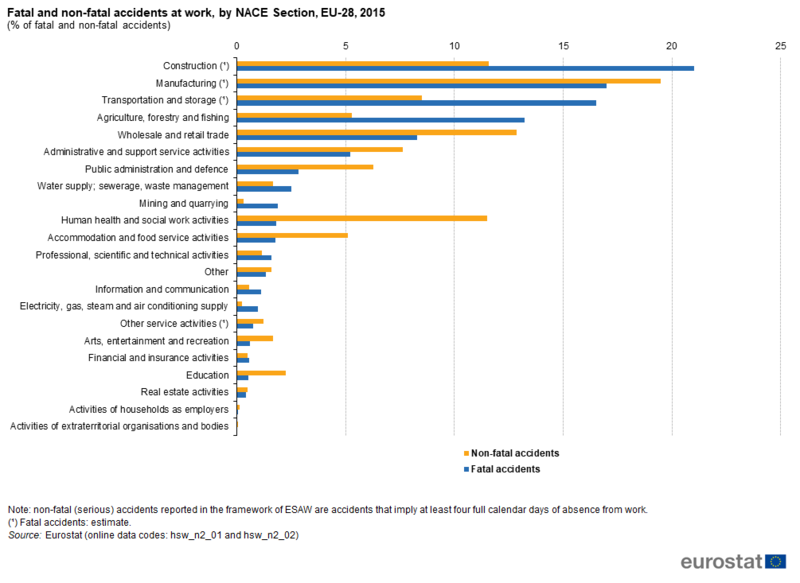 “In 2015, there were 372,282 non-fatal accidents and an estimated 815 fatal accidents in the EU-28 that resulted in at least four calendar days of absence from work” (*GlobalData, 2018). These types of accidents are divided into four main categories of injuries which are listed in descending order of predominance: wounds & superficial injuries, dislocations, sprains & strains, bone fractures and traumatic amputations. Some countries, such as the United Kingdom with introduction of the CSCS card, have led the way in implementing safety measures to protect field workers. The UK is now considered one of the safest construction working environments across the European continent (*GlobalData, 2018). Even though safety measures have improved over recent years, accidents during construction works are still too prevalent especially if we look at foreign markets. For instance, recent accidents in big Indonesian projects, the huge number of deaths due to the ongoing construction of stadiums for the 2022 World Cup in Qatar and the high accident rate in projects in Kuwait and Saudi Arabia raise serious safety questions. Indeed, Saudi Arabia’s Health and Safety Association reported 67,000 work injuries in 2016, leading to US$98.6 million in medical treatment. China is also facing some concerns due to the lack of compliance to safety measures from contractors, which are often urged to deliver quickly, and not trained well enough. However, the growing pressure for better regulations has already impacted the country positively in 2017 since the industrial accidents’ fatality rate was down 17% compared to 2016 (*GlobalData, 2018). In France, safety is more and more at the heart of construction sites, and we have been seeing increasing numbers of security inspections over the years (Le Moniteur, 2008). Companies are now urged to apply strong security standards by proceeding to daily inspections (e.g. equipment check). Most of them have set an objective of “zero accidents”. Field professionals thus need to make safety one of their top priorities, and make sure they provide a safe working environment to all of their employees. In terms of career opportunities, health and safety positions are expected to see a growth in the upcoming years. For instance, in the United States, health and safety specialist positions in the construction industry shall experience a 15.8% growth according to the Bureau of Labor Statistics (BLS, 2018). Indeed, construction companies hire QHSE specialists whose role may consist in monitoring the effective implementation of appropriate Safety and Environment System procedures. These professionals often travel from one construction site to another in order to run detailed inspections. They conduct ordinary safety audits, perform risk assessments, and carry-out safety trainings, among other things. Aside from these recurring types of audits, providing a safe working environment to employees is an ongoing process that needs to be monitored daily. However, considering the large size of some construction projects and the different players involved (e.g. clients, workers, subcontractors, etc. ), maintaining high safety standards is a very challenging mission. Our team has developed a mobile solution that has multiple benefits for users managing safety needs. Firstly, it centralizes all QHSE matters within one single solution used by all stakeholders. Anyone who has the appropriate level of authorization can view relevant information at anytime and from anywhere (e.g. office, home, construction site). The software solution allows to perform precise audits and log information such as safety alerts, text descriptions, photos, etc. All data also becomes available on a regular basis via automated reports sent weekly or on-demand to collaborators. You can easily analyse this data to identify recurring risks and non-conformances. Lastly, this information is synced to an online dashboard where you may find all KPIs and track the global safety levels within your company. FINALCAD has proven to be time-saving and efficient for a variety of use cases, and adapts to all project types: building, infrastructure, energy, and more. Learn more about how our clients leverage FINALCAD for safety needs.